I’m back from a recent trip to Aulani, Disney’s vacation outpost in Hawaii. I am already itching to return – that place was magnifico! 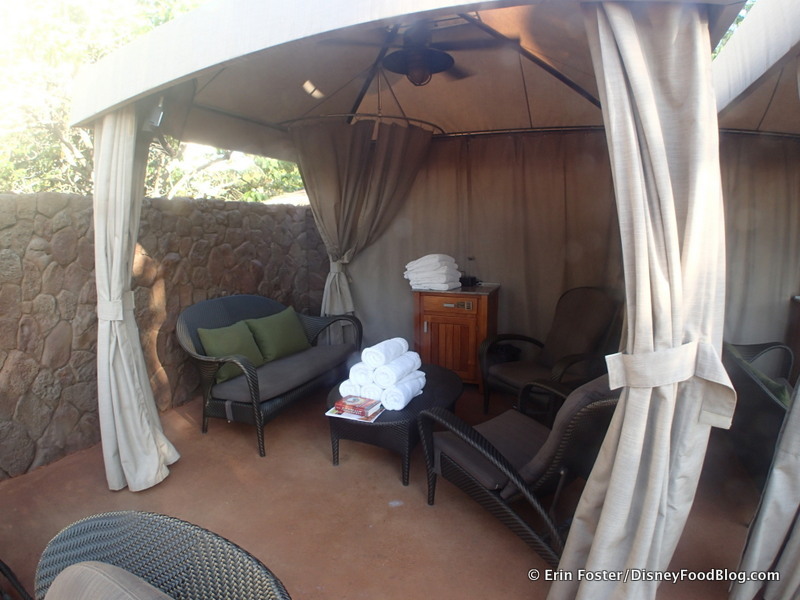 Part of what made it even more over-the-top great was that we had access to a private poolside cabana. Score! We had comfy reserved chairs, a fan, a stereo, a TV (’cause hubby wanted to check in on the football games between swims), water bottles, a constant supply of fresh towels, a mini fridge, and of course, an ever-attentive attendant to keep us supplied with drinks and snacks. Naturally, it’s that drinks and snacks part I want to talk about. We arrived at the cabana at about 9:30, after a big character buffet breakfast, so we weren’t immediately ready to eat. And then magically, as if Mickey himself knew the peckishness was imminent, a complimentary fruit plate arrived. Several Epcot kiosks, including Promenade Refreshments where these came from, have some special offerings for Phineas and Ferb fans. The Power Pack, $7.99, includes an Uncrustables sandwich, carrot sticks, a Danimals yogurt, and a juice box, all served in a souvenir Agent P lunch box. This is a relatively healthy child’s lunch plus a great takeaway for one reasonable price. But the thing I really wanted for me was the Doofenslurper, because how could you not want something called a Doofenslurper? 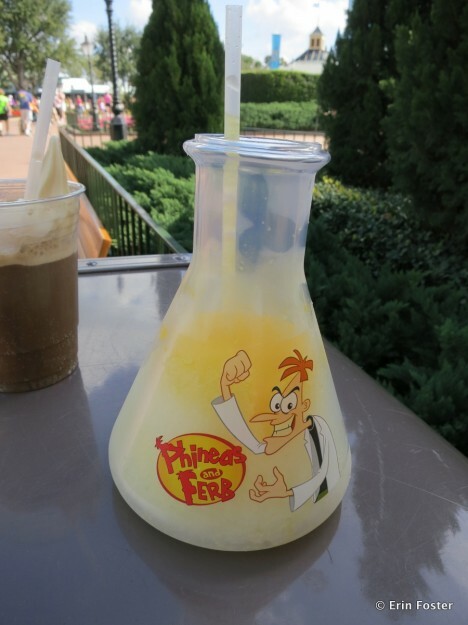 The Doofenslurper is frozen lemonade (more like a slushie) topped with a now ubiquitous fruity foam. As recently reported, the new Les Halles Bakery is open for business in Epcot’s France pavilion. 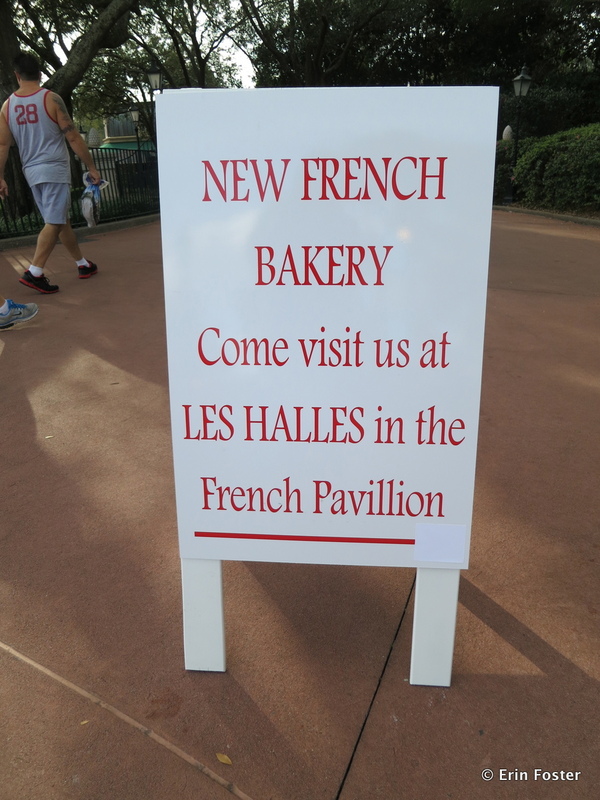 Les Halles replaces the previous France quick service location, Boulangerie Patisserie. 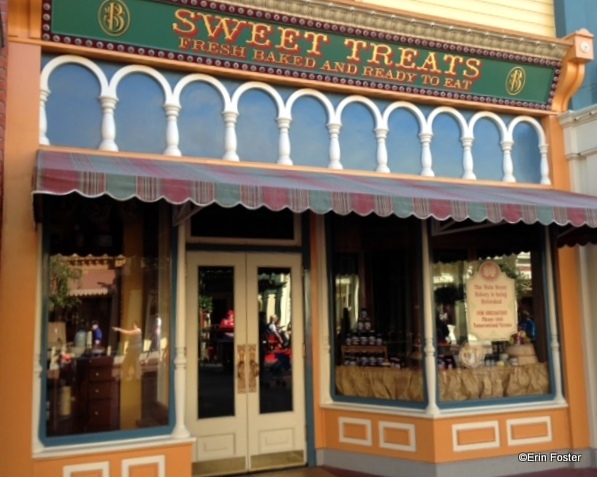 Note that the Bakery opens at 9am — two hours earlier than most other counter-service locations in World Showcase! 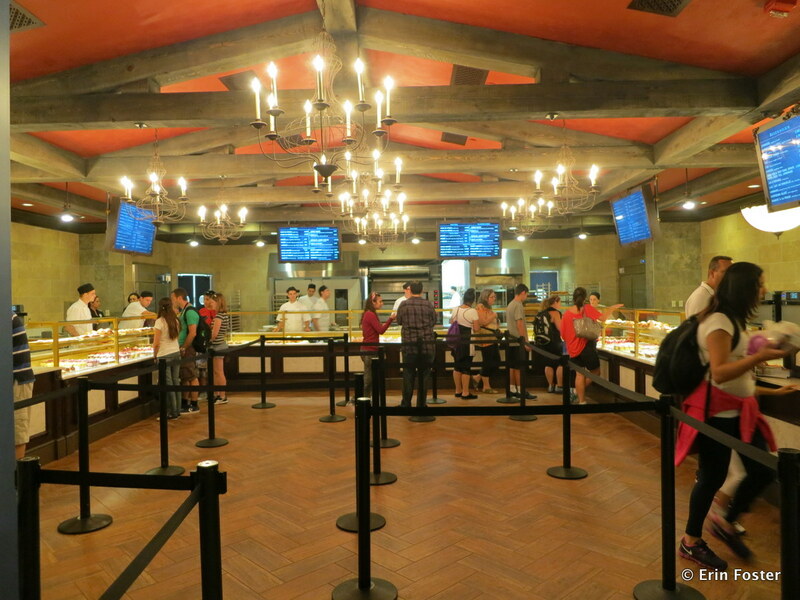 This will definitely be your place for breakfast if you’re entering Epcot through the International Gateway! While I was a fan of the food at Boulangerie Patisserie, I found the narrow service area and lack of seating to be a challenge, particularly when I was traveling with children in a stroller. The large service area and ample indoor and outdoor seating at Les Halles solves these problems and improves upon the French cafe concept with more, and better, food options. While you don’t order these until the end, the first menu you’ll see when you walk into the restaurant lists your beverage options. If you’re using the Disney Dining Plan, all but one of the nonalcoholic drinks is available for a Disney Dining Plan snack credit. It’s nice to see the continuing trend of $4.00-5.00 items available as snacks. 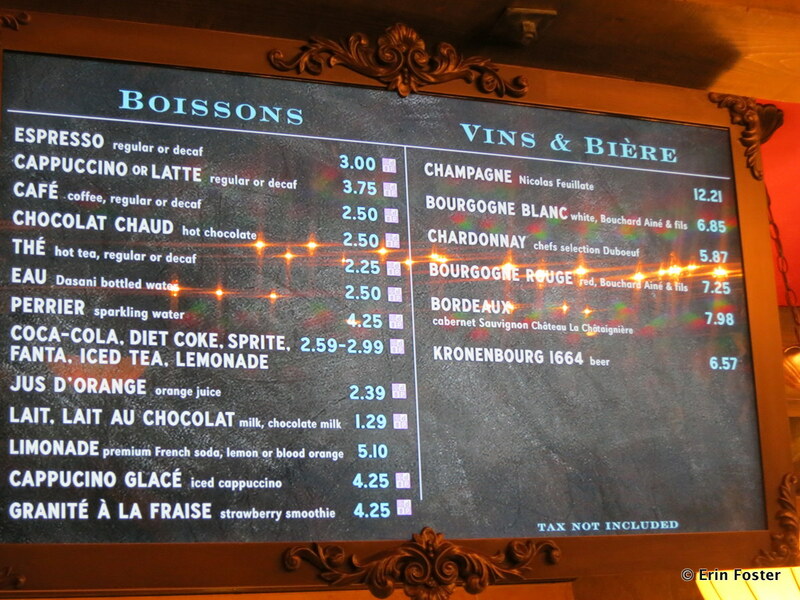 Because you’re in France, of course there are wine and beer options available. I purchased the the Kronenbourg 1664, which was a great accompaniment to my meal; but you should know that all alcohol is poured into plastic cups as it is served to you. No glass is allowed out into the park. 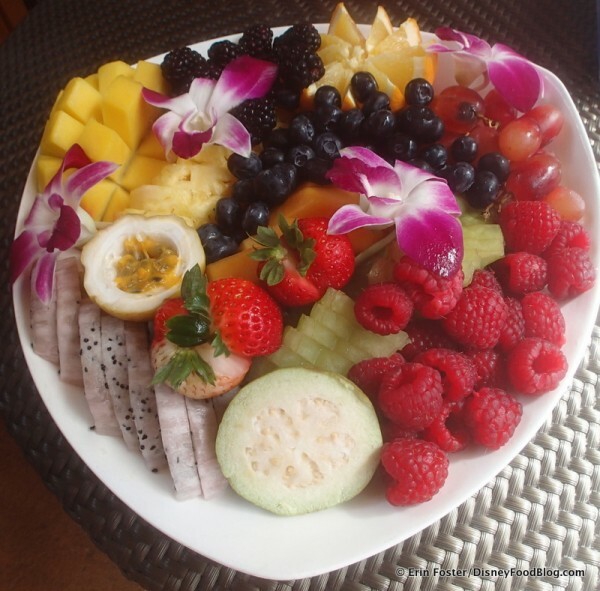 But never fear if breakfast is what’s on your mind. 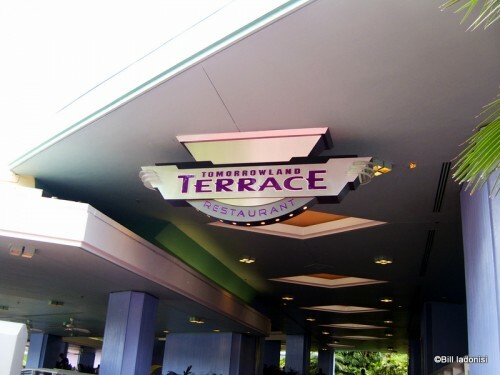 As we reported a few days ago, Tomorrowland Terrace will be serving breakfast eats while Main Street Bakery is undergoing refurbishment and Starbucks-ifying over the next few months! And the fearless Erin Foster, our Disney Food for Families Columnist and Disney Dining guru here at DFB, took some time after running the half-marathon last weekend (GO ERIN!!) to check out the goods! 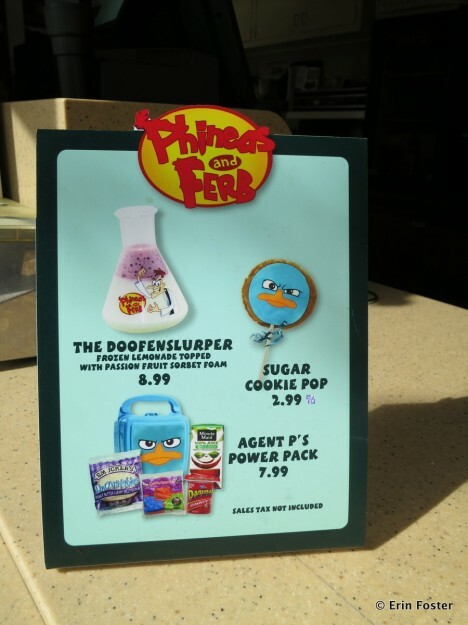 You can see the full Tomorrowland Terrace Breakfast Menu here! 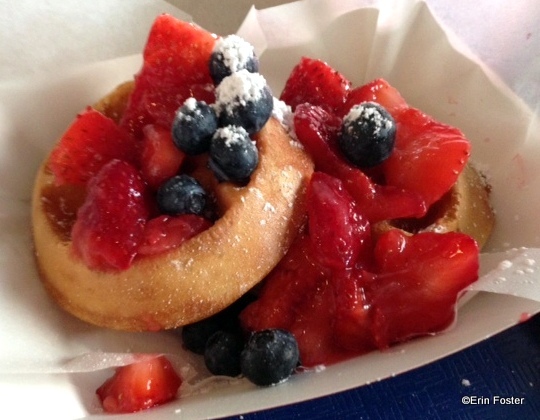 We were excited to see one of Disney’s guest favorite snacks pop up at this temporary breakfast spot. 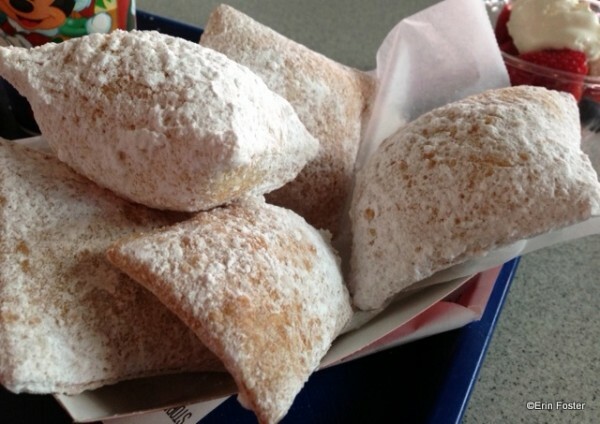 You can see that these beignets are fashioned after those made at Port Orleans French Quarter resort. They’re made fresh, so you may need to wait a few minutes for them after you order. These aren’t quite as light and fluffy as the POFQ version, but they’re a good effort. The serving came with five pieces — two more than you get at POFQ — so they’re easy to share. Also, they’re messy, so be aware — but the powdered sugar is great. We were wondering if these would be Mickey waffles, but they’re more similar to the Belgium Booth waffles from the Epcot Food and Wine Festival. These were good, and are a very reasonable portion size for a normal human being. Syrup is available, but you have to ask at the counter — it’s not at the condiment station. I can see that being a drag if lines were long. I’m back from another fun-filled, fabulous Adventures by Disney trip. 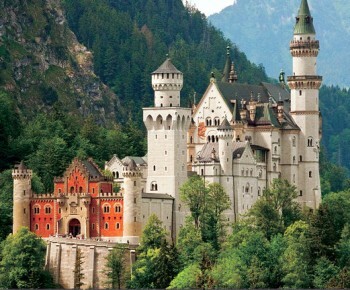 This time it was the “Once Upon A Fairytale” adventure that covered the Germany destinations of Heidelberg, Waldeck, Rothenburg ob der Tauber, and Munich. There were castles and historic villages, archery and the coolest museum tour imaginable (Steiff bears EVERYWHERE), but I’m sure you’re not surprised when I say that the highlight for me was the food. All the many permutations of schnitzel, spaetzel and strudel are too numerous to mention (truly, we ate schnitzel and spaetzel every day), but here is a taste of what else we saw and tasted. Our first official stop of the tour was Heidelberg Castle. 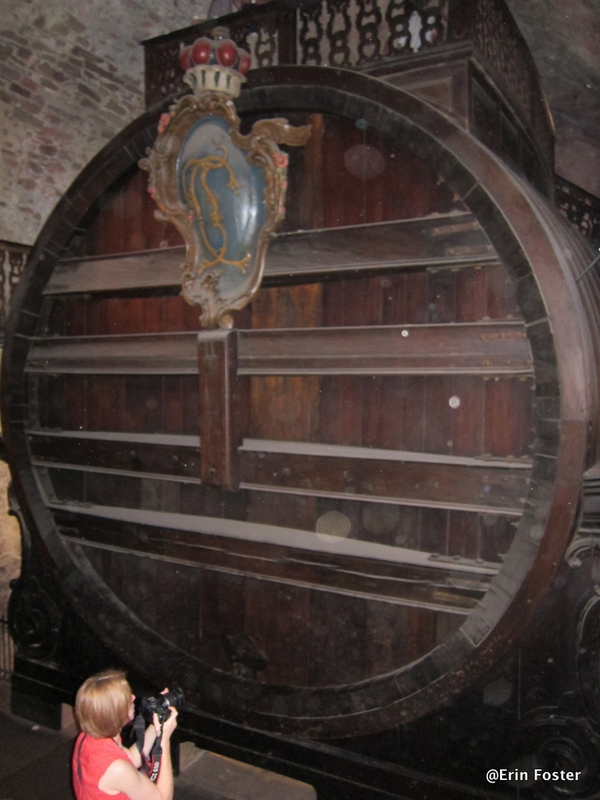 From a foodie perspective, the big attraction was the world’s largest wine barrel, the Heidelberg Tun. Our guide informed us that the Tun holds more than 55,000 gallons of wine. While long empty, it was actually functional for a number of years. 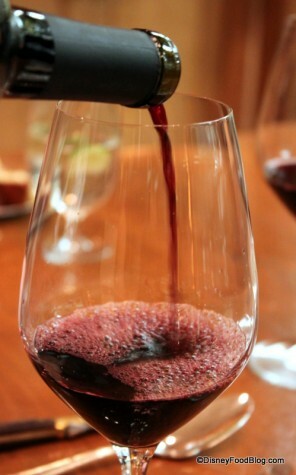 But apparently wine stored in 55,000 gallon barrels is kind of nasty. Who knew? So the giant-cask contents were used to hydrate servants and other common-folk. Royalty and nobles were served from normal-sized bottles. The world's largest wine barrel. During our second evening of the trip, we dined at Zum Güldenen Schaf (Golden Sheep) restaurant on the Hauptstrasse in Heidelberg. This sprawling venue was decorated with heraldic symbols, portraiture, and charming hand-carved benches. 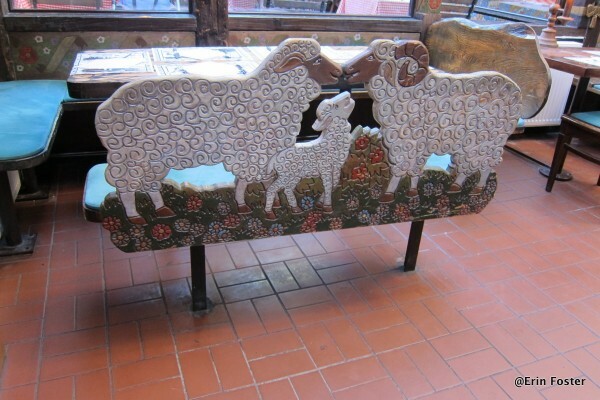 Hand carved sheep bench at the "Golden Sheep"
Dinner started with a choice of salad with prosciutto-wrapped goat cheese or a creamy potato soup. Not long ago, AJ wrote a post about the classic Japanese snack, Pocky, found in the Japan pavilion at Epcot. The one tidbit of information in this post that got the most comments was the mention that among the multitude of Pocky flavors is Men’s Pocky. That’s right — Pocky, FOR MEN. 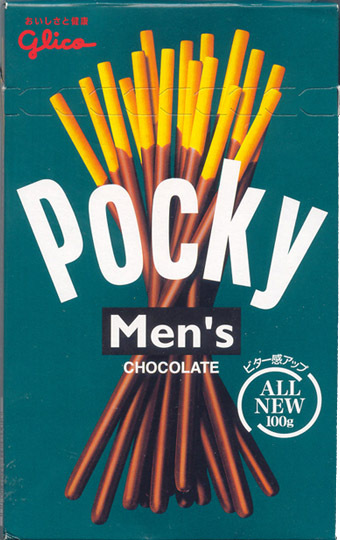 While Men’s Pocky is a product of Japanese culture primarily, this discussion got me wondering if there were any other “male-specific” foods sold at Walt Disney World. The Prince Edward’s Tea: the same as the Gentleman’s tea, but with the addition of scones, Devonshire cream, and a glass of port. 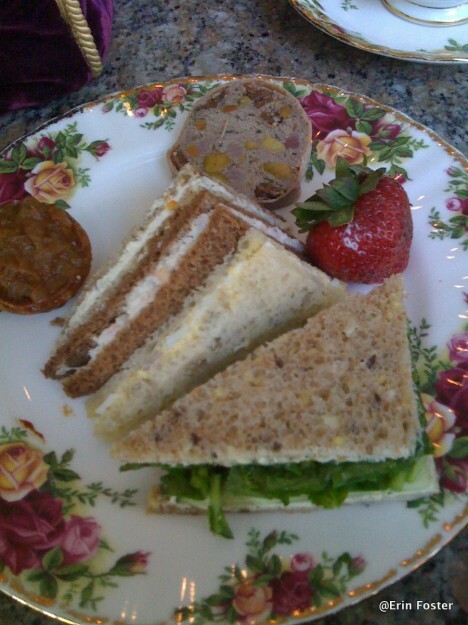 Real men need special food to save them from the terror of the crustless sandwich at the Garden View Tea Room. Normally I write about Disney Food for Families. This means I share tips about dining with children at Walt Disney World. Sometimes a glass of wine hits the spot after a long day in the park! Don’t tell my kiddos, but sometimes, after a long day of hunting for FastPasses, adjudicating squabbles, masterminding wait-time entertainment, and taking the brave one (why is there always a brave one?) on Tower of Terror for the third time in a row, yes sometimes Mommy needs a evening unwind, facilitated by a little drinkie-poo. Yep, sometimes old Mom needs a glass of wine. Wine and other friendly alcoholic beverages are, of course, readily available at restaurants and lounges throughout Walt Disney World. Heck, you can now even get yourself a nice Pinot Gris in the Magic Kingdom. But often the place you most want your relaxing drink is where you can, you know, actually relax. You want your adult beverage in your hotel room, when the pups are asleep. You want to be able to shower off the day, put your feet up, snuggle in front of a non-G-rated movie, and enjoy your vino in your jammies. Can’t do that in the bar downstairs unless you’re in the mood for some unwanted attention from security. The obvious solution is to bring a bottle of wine to your room. 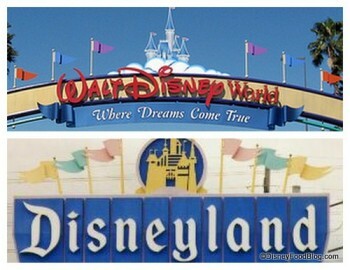 And, having always thought of everything, Disney is ready to accommodate. 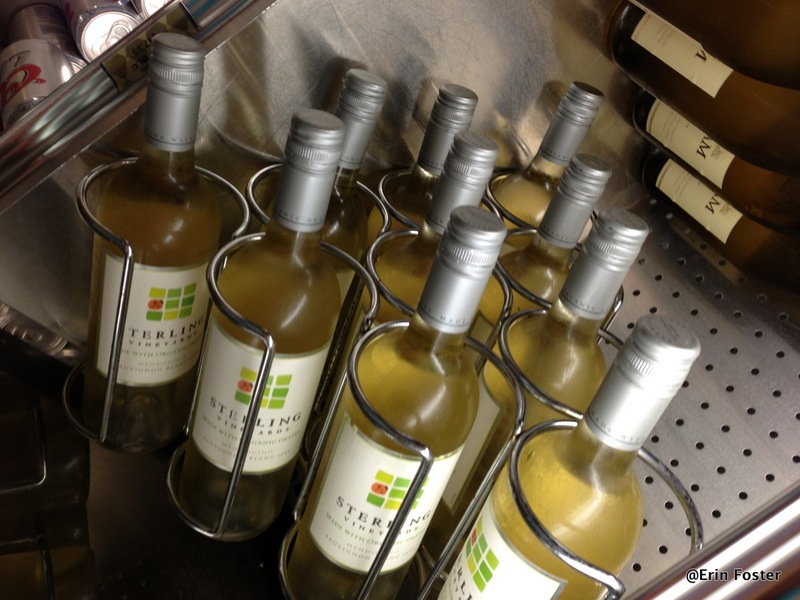 The selection of bottled alcohol varies quite a bit from resort to resort and from week to week. But generally you can find several brands of domestic and imported beer, basic hard liquors, and a handful of red, white, and rose wines. The deluxe resorts also often have chilled champagne in their refrigerator cases. I’m a Disney dork and a die-hard New Yorker. I go dizzy happy when these worlds collide and I get to experience Mickey magic here in the Big Apple. 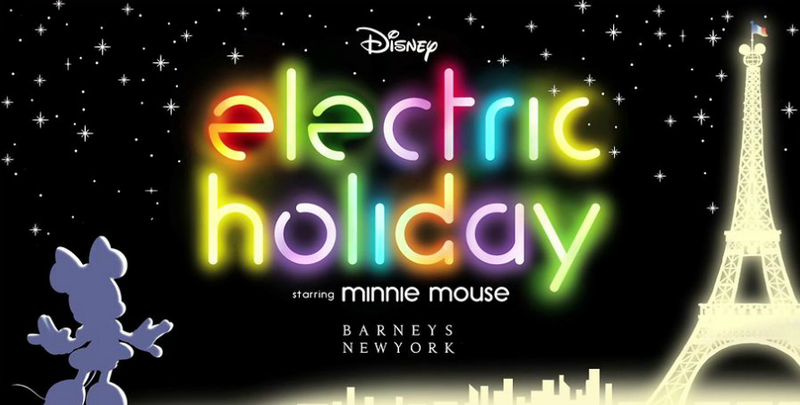 So it will come as no surprise that my heart skipped a beat when I heard that the ultra chic Manhattan department store Barneys New York would be featuring Disney characters and merchandise in its holiday 2012 promotions, called Disney Electric Holiday. Barneys is located on Madison Avenue at 61st Street, in the heart of the City’s poshest shopping district. I’m handy with a credit card and thrilled to paw the racks at Sak’s Fifth Avenue, Bloomingdale’s, and even tony Henri Bendel, searching for marked down Tori Burch flip flops and DKNY sweaters. We’re back with another food review from the Quest for the West Adventures By Disney trip, covering the wilds of Wyoming including Yellowstone and Grand Teton National Park. You’ll remember the incredible eats we had over at Brooks Lake Lodge, of course; but today I’ve got something a little more playful for you! 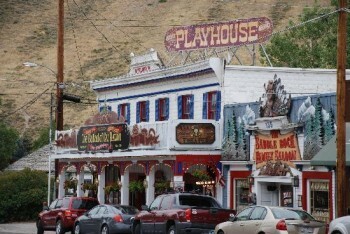 Lunch on day two of our trip was at the historic Jackson Hole Playhouse. 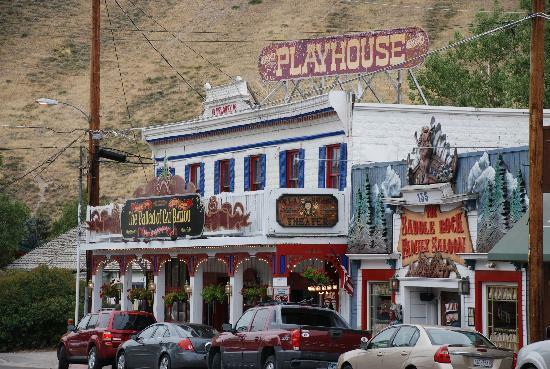 Founded in 1916 as a buggy shop, the Playhouse now performs Broadway-style shows each evening as well as serves up hearty Western fare in its saloon. 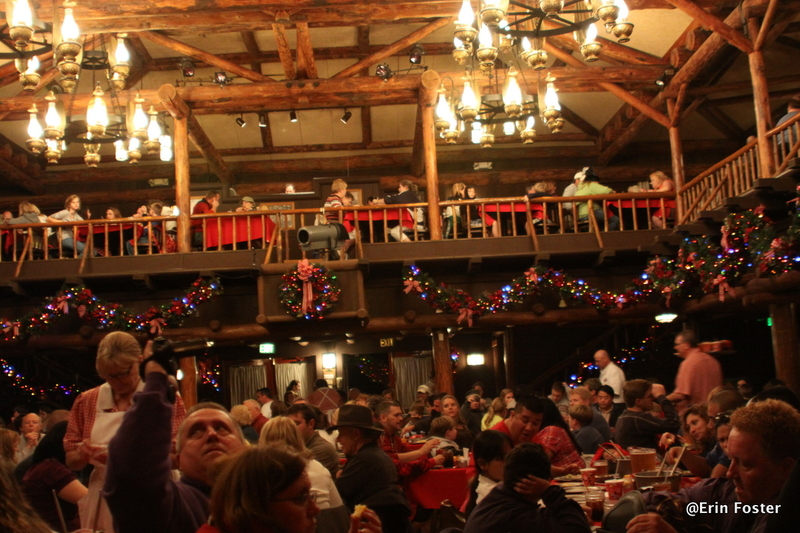 While the food was yum, I was most enamored with the decor, which practically screamed “Hoop Dee Doo” at me, reminding me over and over of this favorite Disney World dinner show! From the cute glasses to the red table cloths and the costumed server/singers, so much at the Playhouse was similar to the Hoop Dee Doo Revue, I kept thinking that I’d see Dolly Drew dis Sixbits any second now. The female performers even flirted with and sang to an embarrassed gentleman in the audience, leaving a bright red lipstick kiss on his cheek. I’m not sure which was the chicken and which was the egg, but warm Hoop Dee Doo familiarity of the Playhouse made me feel like I was right at home. A Disney World Foodie Meets Disneyland! I’ve been averaging five or six Walt Disney World visits each year for the past five years. And mostly what I do when I’m at Walt Disney World is eat, no joke. 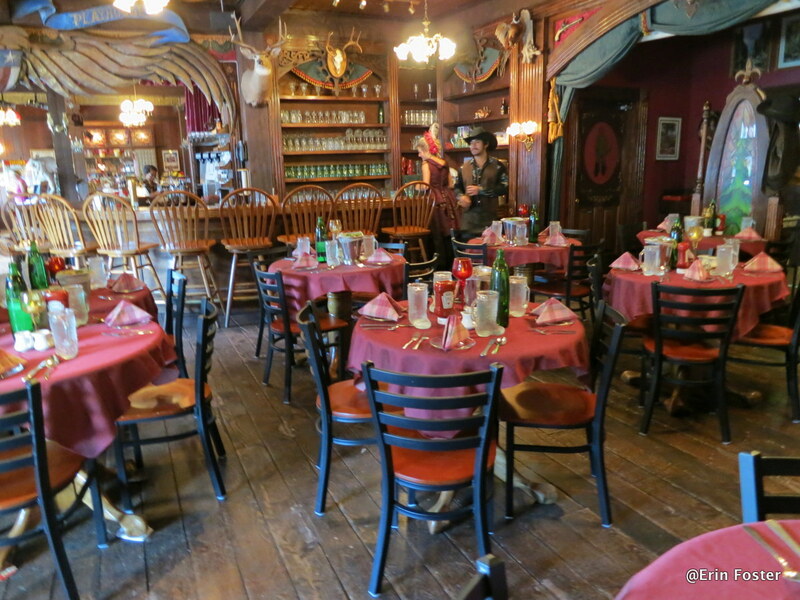 But I recently found myself in unfamiliar Disney dining territory while on a brief visit to Disneyland in California. I had been there only once before, many (many, many, many) years ago. With just two days on my own, I decided to experience the parks like the newbie that I am, without a plan or preparation. Well, I did ask Disney Food Blog fearless leader AJ for a wee bit of advice, but I’ll get to that later. 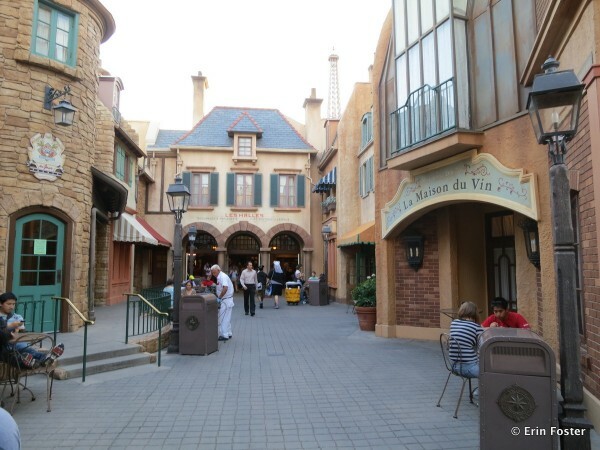 So, without further ado, here, in no particular order, are my Walt Disney World foodie veteran observations about the dining situation at Disneyland. 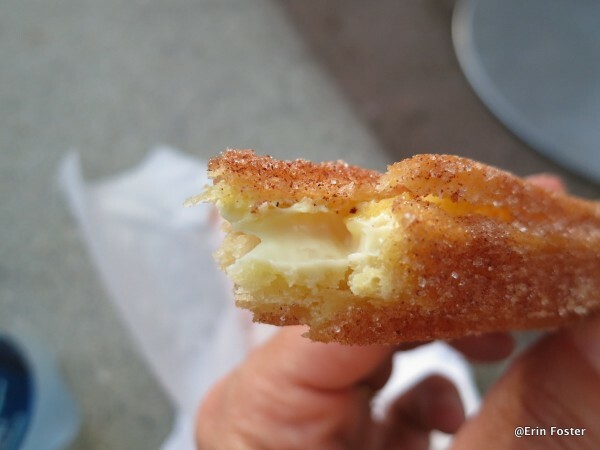 While of course you can find churros at Walt Disney World, there are usually only a few locations at each park that sell them. At Disneyland, everywhere I turned there was a churro sales stand or someone walking along nibbling on a churro. A Barvarian cream churro at Disneyland. I want an umbrella too! 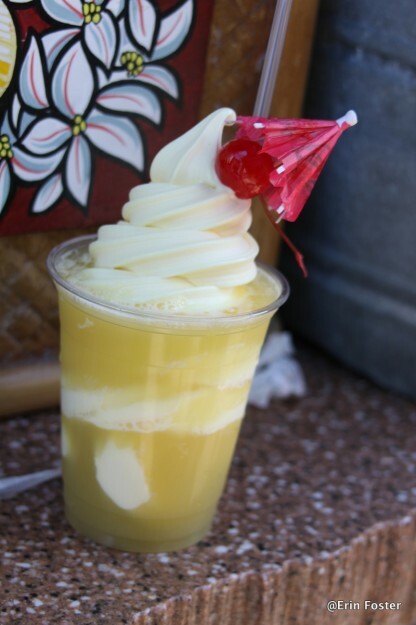 I am all about the Dole Whip Float at Walt Disney World. But guess what, at Disneyland, they serve this nectar with maraschino cherries and a little paper umbrella. I feel robbed. I think Disney owes me at least three or four bottles of cherries that I’ve missed out on over the years. Such a pretty Dole Whip Float at Disneyland. 3-D ice cream menus rock.